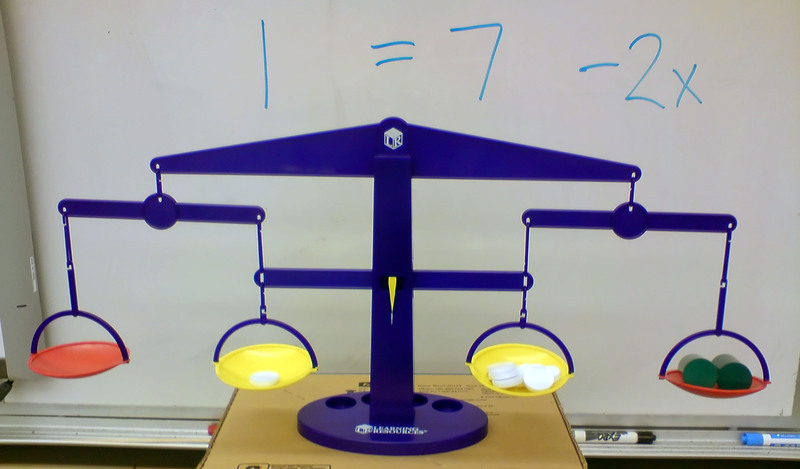 I’ve been using this algebra balance in my Algebra 1 classes to illustrate concepts having to do with equations. This balance is unique in that it has two pans on each side. The yellow pans represent positive quantities and the red pans represent negative quantities. The white chips and the green containers (representing the “x”) have the same weight so you can easily set up simple equations using the pan. It’s been a minor hit so far. Students seem to understand that you can maintain the balance by adding or taking something away from each side of the balance. This and next week we’re working on making the appropriate moves on the balance and solving equations without the aid of the balance. I’ve gotten students used to solving equations like “2x-1=9” by inspection; the unintended consequence of this is that students are a bit puzzled why I’m going through so much effort how to add 1 to both sides, etc. If it works, it works, but I’m not a fan of these models. The biggest reason is that they give a weird impression of what equations mean: the goal is to “find out what x is”, rather than to “find out what x makes the equation true”. The other reason is the limitations of the model to specific types of equations. While this does better than most with the “negative pans”, there are still some major issues — what if it was 1/2x or 0.7x instead of 2x? what if it was 1 = 7y – 2x? or 1 = 7 – 2x^2? etc. If it helps students picture the operations they need to use to solve equations, good deal, as long as you make sure they can move past the model. And the more time spent on a model, the harder that is. By the way, for 1 = 7 – 2x, here are two other methods you might try. One, cover up “2x” with your hand and ask students what the hand would be. If they say “6” (hopefully) then you can write 2x = 6 and proceed. Two, describe the steps then “backtrack” (reverse the steps). Here, x is multiplied by -2, then add 7 to get 1. So, subtract 7 from 1, and divide by -2 to get the value of x that makes it true.